Book in One Word: Arrgghhhtastic! 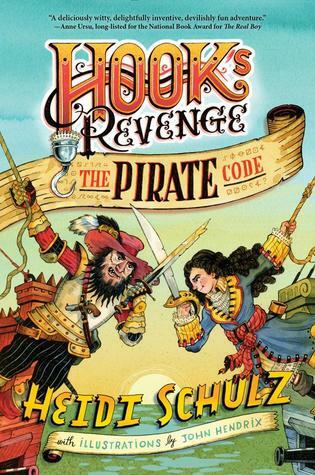 The Pirate Code starts not long after Hook's Revenge left off (aye, there be spoilers for book one ahead): Jocelyn & Co. defeated the Neverland crocodile, rightfully avenging the death of dear old Captain Hook, and now Jocelyn is left with a coded map that leads to her father's treasure--because if you didn't know, this series tells the swashbuckling tale of Captain Hook's daughter Jocelyn. What's nice about these books is that they--and Heidi Schulz--do a lot of things well. Neverland is interesting, there are adventures upon adventures, the characters are dimensional and fun, Jocelyn is a fantastically stubborn little thing, and her voice, coupled with that of the narrator's, helps complete the whole thing. It's all just such fun, and something I believe readers of any age will enjoy, and that just makes a book more magical. I adore Jocelyn. She's a tough cookie who still has some dough in her heart, and her mouth tends to be more spicy than sugary. A la Ramona Quimby and Junie B. Jones, Jocelyn is a sassy, witty, delightful character who's quite memorable. And it doesn't hurt that she has a ragtag crew of awesomeness (#squadgoals) to help her in her adventures. There's Mr. Smee, who I can perfectly picture like the Smee from the Disney animated film, and I love him. And there's Meriwether, the jealous little fairy who likes to hide in Jocelyn's hair. He's one of my favorites. There's something very successful about a character who can be so likable and dimensional but doesn't really utter a word. There are some new characters, too, who I won't mention because of spoilers, but let's just say that I rather liked them. And last but not least is Roger. Now, I know this is Middle Grade, but I ship Jocelyn and Roger so hard. And Roger is an extra great character because he's a such a good friend and a generally good person--and pirate, for that matter--and you just can't help but like him. So the characters--ugly-faced evil enemy pirates included--get an A+++. I don't want to say too much about The Pirate Code for fear of giving away the story, but I want to take a second to discuss the writing and narrator. Now, if I had to come up with some point of criticism for this book--just because I had to, not because it's worth mentioning (because it's not)--I would say that there were a few scenes I wanted more from, or that were just a little too quick. But I think that's also kind of how Middle Grade works--like, a fight scene probably won't go on for ten pages, like it might for YA. So it's not really a complaint. Because really, seriously, honestly--Heidi Schulz can write. Certain novels call for certain kinds of voices, depending on the story and tone and mood and all that, and the one for this series fits perfectly. It's light and witty and full of such charm that's hard to resist. And the narrator--really, this is Jocelyn's story, but every once in a while the narrator will delve into first person point of view, and you remember that you're in two people's heads (sort of), not one, and you can't help but love that narrator, who is also one of my favorite characters. Such wit in this book, such fun, and it goes together like bacon and my mouth. I love it. Perhaps you, dear reader, are wondering if you should read this book. If you are (and even if you aren't), the answer is yes: you absolutely, positively should. (But read Hook's Revenge first, obviously.) I mean, who needs to fly away to Neverland with Peter Pan when they can hang out with Jocelyn Hook and her fierce pirate crew on the Jolly Roger? This is a refreshing, utterly unique spin on a tale we've heard many, many times, yet it still keeps pretty true to those bits of Neverland we know and love so well. (There's also a conversation in here between Peter Pan and Jocelyn about thimbles, and it's more golden than any pirate or king's treasure, I swear it.) I hope you're ready for a story spun with effortlessly wonderful writing, a colorful cast of characters who are sure to rub off on you in all the best ways (except for nasty pirates who think they're more piratey than you), and that will make you smile from ear to ear...and possibly cry. Because that's what you're getting with this series. And to read it would be an awfully big adventure. Did I love it? Just about. Would I purchase it? I already have it (and it was preordered)! Who would I recommend it to? If you're a fan of Peter Pan, pirates, excellent narrators, sassafrass characters, and stories filled to the brim with adventure, then this is so the book for you (just be sure to read Hook's Revenge first). Love your review and I agree wholeheartedly! I couldn't help picturing Smee as the Disney Smee and Meriweather was soooo feisty and cute :D Oh my gosh, Ramona and Junie B, two of my favorites! Jocelyn definitely fits in with them. And yeah I TOTALLY ship her and Roger something fierce. Give it 5 years or so haha. 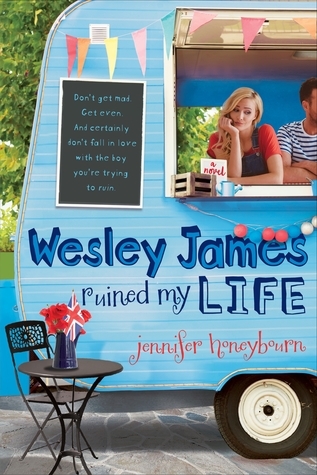 I was also surprised at the amount of heart and emotion that really tugged at me; I loved the twist on who they met in Neverland :) One of the best sequels I've read, totally charming like you mentioned. I hope there are more books someday! Multi function application for your every demand and also option. Mobdro Free Download you could bid a goodbye to this 'Mobdro Not Working' issue. There are lot numerous functions that are consisted of in the costs Mobdro App version from cost-free variation is that it eliminates.